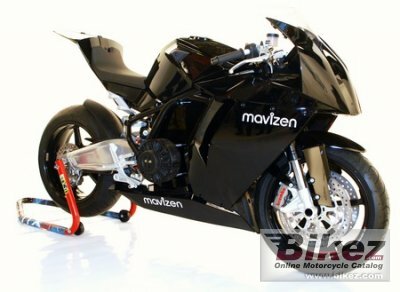 2012 Mavizen TTX02. Picture credits - Mavizen. Submit more pictures. The TTX02 was initially built for racing, as an off the shelf race bike. A TTX02 has competed in every round of the TTXGP season, with three in the Final at Albacete, Spain. This has been a fantastic development opportunity and the lessons learnt from the experience have been directly transferred to the bike. Engine details: Twin DC Brushed Electric Motors. Instruments: Touch screen user interface and on board PC that is integrated into the bike�s electronics. Electrical: 96V 7.5 kWh Lithium Polymer Battery Pack. Charge time: 4 hours. Comments: Swappable drivetrain and batteries at trackside. Charging time 4 hours. Integrated IP connectivity. Linux based. USB based system bus allows a virtually unlimited number of peripherals to extend the capabilities of the machine with plug�n�play. Remote factory support package available. Ask questions Join the 12 Mavizen TTX02 discussion group or the general Mavizen discussion group. Click here to sell a used 2012 Mavizen TTX02 or advertise any other MC for sale. You can list all available Mavizen TTX02 bikes and also sign up for e-mail notification when such motorcycles are advertised in the future. Ads with or without pictures are easy to create. Our classifieds are completely free with sections for every country in the world. You can also check out our list of related motorbikes. Compare technical data. Look at photos. View your fellow riders' rating of the bike's reliability, design, engine performance, accident risk, repair cost, etc.